As a nature lover myself, I’m always looking for ways to bring the great outdoors inside my home year-round. DIY Succulents: From Placecards to Wreaths, 35+ Ideas for Creative Projects with Succulents by author Tawni Daigle, has become my new favorite nature-inspired home décor book that not only satisfies my desire to surround myself with wildlife but flexes my DIY muscles in fun and interesting ways. 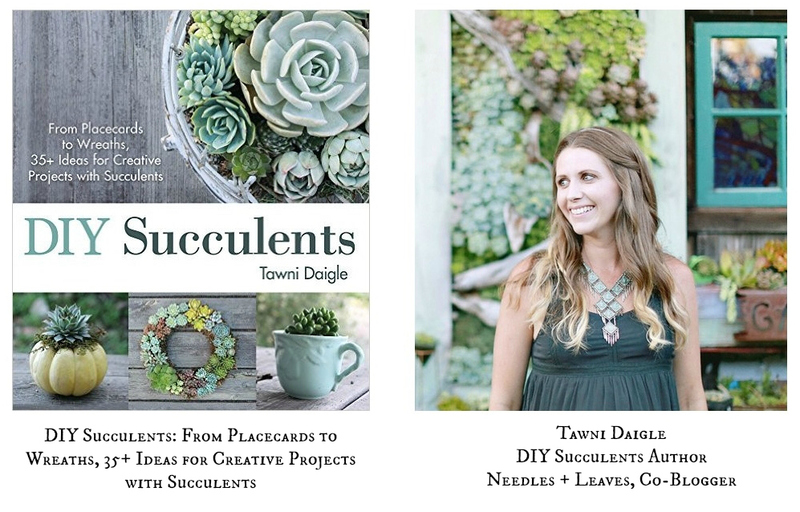 Tawni Daigle is not only the author of DIY Succulents, but a Co-Blogger of the popular blog site Needles + Leaves, a blog dedicated to showcase both her and her sister-in-law’s (Krista) love for succulents, crafts, and succulent related projects with inspiring photos and detailed DIY tutorials. This brand new DIY book includes over 35 succulent projects that anyone can read, follow, and complete with a short list of supplies and common garden tools. Daigle has included numerous projects to inspire beautiful home designs both indoor and outdoor, like the Succulent Address Plaque shown below, to succulent wreathes, and even succulent filled tea mugs to adorn your indoor coffee table using plants like beautiful and resilient echeveria, sedum, and graptopetalum. I absolutely fell in love with her Vertical Framed Succulent Garden project featured in a lavender shabby-chic frame that I would love to add to my young daughter’s bedroom walls, not only bringing life to her individual space but teaching her appreciate and nurture Earth’s bounties. Other creative and easily created succulent DIY projects include creating stunning nature-inspired décor elements for parties, and even elegant Wedding centerpieces and place cards. 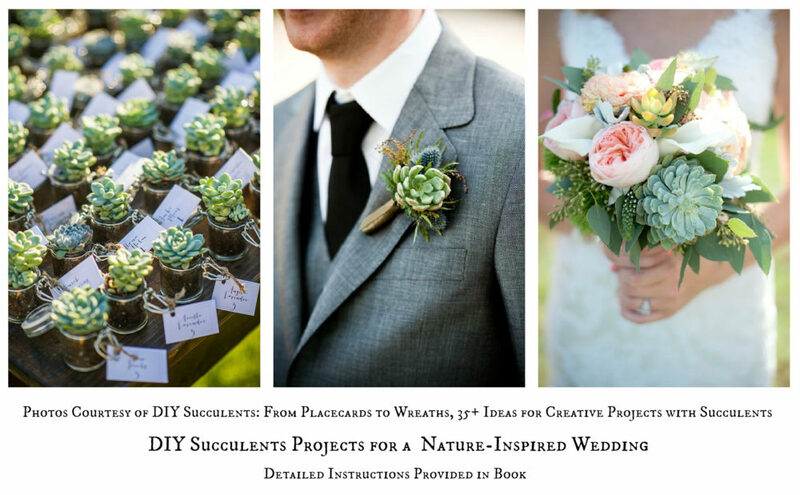 The images below are just a few examples found inside DIY Succulents that could be used for beautiful wedding ceremonies such as place cards, table numbers, boutonnieres, and the bridal bouquet. The fall season ushers in the year’s holidays and with Halloween right around the corner all the major big-box stores have begun to haul out the usual “tacky” Halloween decorations but that doesn’t mean your Halloween designs can’t stay true to your own simplistic and elegant easy-going aesthetic. Adding succulent plants with select Halloween décor can elevate your spooky centerpieces to a more mature and elegant look with little fuss. Daigle has included easy to follow instructions for hollowing out pumpkins to top with succulents. Halloween isn’t complete without a few skeleton skulls lying around so why not add succulents inside the top part of removable skull tops, or inside the eyes to protrude outwards. Highlight a succulent garden by adding miniature headstones of various sizes to add a simple creepy factor. This book includes succulent ideas for popular holidays such as Christmas & Easter so you’ll never run out of ideas! I certainly recommend this book for all, if not for its beautiful & tranquil images alone, certainly for its inspiring DIY projects, great affordable project prices, and sharp creativity that will bring personality to every part of your home. 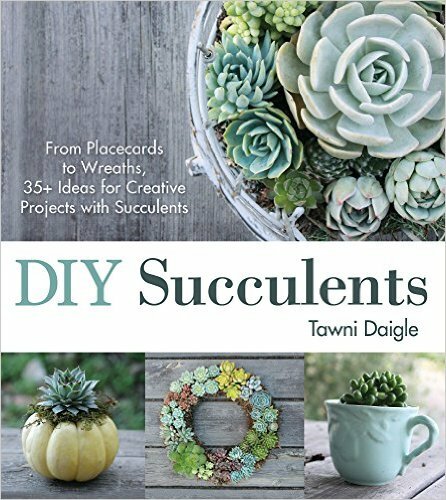 DIY Succulents: From Placecards to Wreaths, 35+ Ideas for Creative Projects with Succulents by Tawni Daigle is available for purchase at Amazon, and connect with the author through her exciting blog at Needles + Leaves, Pinterest, Facebook, and Instagram. Oh this sounds like a book for me– It would be nice to find things to do with the few different succulents I do have. Dianna I know you’ll love it! I don’t have any succulents at the moment but as soon as I can get to my local nursery I will most certainly be getting some! Feel free to share any pictures of yours! Thanks so much!